Shane informs me that the jerseys are officially in the mail via USPS Priority Mail. He's included a wool care document so you don't accidentally shrink it to a child's size. One of the things it say is "DON'T USE WOOLITE"
A big THANK YOU, Shane, for your initiative and follow-through with this project -- PA Jerseys have been something a number of riders have asked about over the years, but I never seemed to get around to. Good news the PA wool jerseys are finally in! I'm going to be sending them out this Saturday (Oct. 1) via the struggling USPS (my way of trying to help out). If you don't receive them by the following Saturday Oct. the 8th please get in touch with me. Thanks for a great job Shane! ...Please let Tom R. know of any corrections or other issues. Results will be sent to RUSA shortly, and then become final, pending ACP approval. The weather provided nearly ideal conditions for cycling, though I'm certain a few riders wished it had been a little warmer at the start. Fortunately, early afternoon rains that appeared in the Lancaster area didn't soak the riders. I heard reports of wet roadways, but no rain. After all the rainfall that has innundated the area in the past few weeks, a precipitation reprieve was quite welcome. Six riders took advantage of conditions and bested the course record by a few minutes. PA Randonneur regulars Bill Fischer, Matt Farrell and Gavin Biebuyck along with rando rookies Geoff Brunner, Jimmy Aspras, and Thomas Vendetta zipped around the course in 8:34 in spite of an extra two miles in course length and a bonus mile early on. Rando rookies they may have been, but they are hardly new to cycling. Geoff is a 2011 RAAM finisher while Jimmy and Tom are regulars in the NJ racing scene. The rest of the field completed the course in better than average times. I saw lots of smiles as I checked in riders at the finish, though most were quite glad to be finished. Even well-known controle dining connoisseurs Bill Slabonik and Keith Spangler finished with nearly an hour and a half to spare. (See guys, you really did have time to go to the DQ in Lickdale for a Blizzard!). Rick Carpenter brought his Bianchi fixie to ride, a move which would usually garner a "most interesting equipment" mention on this route, but newcomer Peter Yuskauskas took the honors this year by completing the route on a Brompton folding bicycle. 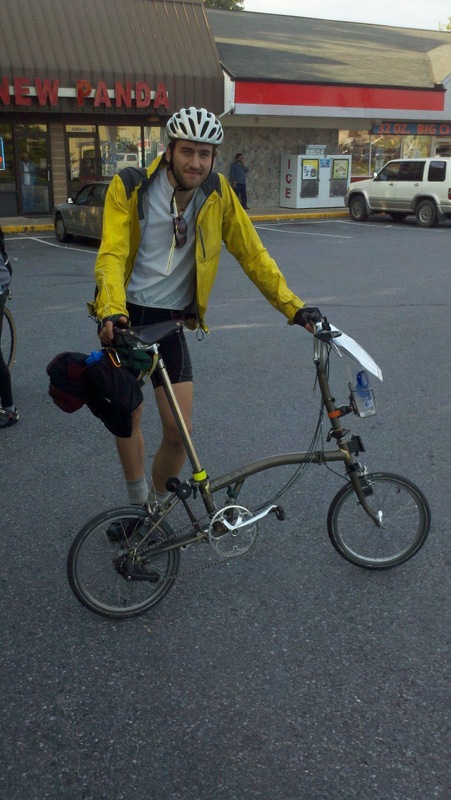 Perhaps more impressive is that Peter took the train from his home in NYC to Lancaster Friday evening, rode to the start and camped out under the stars in the truest randonneuring spirit. In what has become an informal "pictures per mile" competition, Nigel Greene shows that he's taking no back seat to Shane. You can find Nigel's pictures on his Flickr site and read his excellent report on his Iron Rider blog. Rick Carpenter took a few pictures as well. You can find them here. Next up is the fall classic populaire and brevet on October 22 at Quakertown. Hope to see you then.